Quest will reset 5 hours after it has been done. 1. 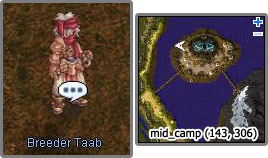 After seeing an announcement that Breeder Taab (mid_camp 143, 306) is hiring, offer to help him. Each of the first five volunteers are given a task. Receive 80,000 Base EXP and 30,000 Job EXP. Receive 90,000 Base EXP and 40,000 Job EXP. 2. He asks you to go rest.